So the awesome piece of advice that I received for this month is to invest in yourself. I was talking to one of my friends who is an excellent dresser, (I'm a nerd to the fullest because I love wearing jeans and t-shirts to everywhere I go), and he was telling me that you should invest in yourself every single paycheck. Fortunately for me I have a job where I don't necessarily right now that I have to show up dressing nice every single day. But I'm getting to that point where I want to make that transition into something a little bit more professional and I reached out to him. He gave me the basic lesson in taking the time to value yourself through the way you dress. I know the whole analogy about you dress how you feel and that you can feel 10x better about how you feel when throw on those clothes. Now I will admit when I throw on some nice slacks, nice dress shirt, tie, shoes, basically the whole deal, I feel pretty awesome and I get a lot of compliments. But about an hour into it, I'm just ready to strip down and get into some pants and a t-shirt again. I know that wearing those clothes conveys a sense of self respect and poise that most professional businesses are looking for, I'm just trying to tell myself that everyday until I actually care lol. The point of this all is to invest in yourself constantly, no matter how little it is because other people can tell when you do. 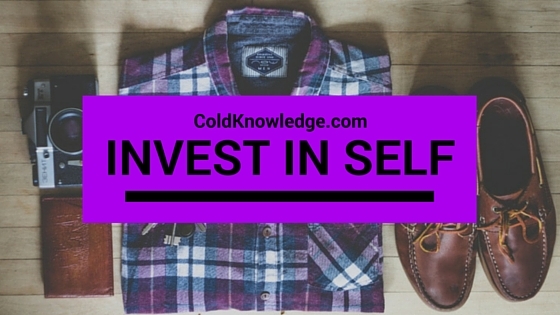 Investing in yourself means you do things that bring up the overall value of you. So if you see some shoes that are cool but don't think that you want to pay the freight for them, or you think this necklace will look good with an outfit but you don't think it's wise to buy it at the time, I say to you this, just do it. At the end of the day that one thing that you don't buy, you will end up spending the money on something else instead. I know for me that ever since I stopped eating out and cooking at home I've had way more money to go out and buy things. You don't even have to go out and buy the most expensive thing or a whole bunch of things that are expensive. You can simply go to the store, peruse and find something that costs 12 bucks, but looks like it's a million dollars on you. As my friend said, it's all about how you give off the vibe with the accessories that adds value to you. This was just a little reminder that if you're out here constantly doing everything for everyone else and you're wasting money on frivolous things, take the time to reevaluate that and see where you can cut back and add something more awesome instead. Remember to invest in yourself because at the end of the day no one else will until you do.